This week’s issue of Secret Empire was the best in the series so far because it challenged its characters to own up the many mistakes that led up to the event. But, in a single panel, Secret Empire also undid years of work that Marvel put into healing one of its most important and misunderstood heroes: the Scarlet Witch. In Nick Spencer, Leinil Francis Yu, and Rod Reis’ Secret Empire #4 we get our first good look at the Scarlet Witch since Secret Empire’s Free Comic Book Day issue, in which Steve Rogers was inexplicably able to overpower her and every other Avenger who attempted to stop his invasion of Washington, D.C.
Rather than explaining how exactly Steve was able to overpower one of the most powerful people in Marvel’s comics, we’re told instead that Wanda was possessed by the demonic elder god Chthon at some point off-panel and Steve convinced the demon to do his bidding. And that’s it. When Quicksilver tries to reason with the person he thinks is his sister, whomever is inhabiting her body responds that Wanda’s no longer there. Considering that this is Secret Empire, a series that’s been known for its plot holes and emphasis on shock over substance, Wanda’s possession is no more surprising than Steve’s sudden ability to pick up Thor’s hammer. But in so casually neutralizing Wanda by literally giving her body over to a demon, Secret Empire is undoing much of the important work Marvel did in rehabilitating her image in the Scarlet Witch solo series that wrapped up back in February. Since her first appearance in 1964's X-Men #4, the Scarlet Witch has gone from being a C-list criminal with the ability to “hex” people with bad luck to being one of the most powerful Avengers in Marvel history and one of the first Romani characters to appear in comics. While it’s been interesting to watch Wanda’s evolution over the years, the growth of her powers coincided with a number of writers deciding that mental instability would also become one of her defining traits. Depictions of people living with mental illness are important, yes, but in Wanda’s case, she was most often depicted as having psychotic breakdowns that caused her magical, reality-warping powers to flare up dangerously. The sizable powers that made Wanda such a fascinating, sizable presence in Marvel’s books eclipsed who she was as a person. Wanda became a mentally fractured time bomb and for a while, the Scarlet Witch was a study in the misogynistic idea of female hysteria. 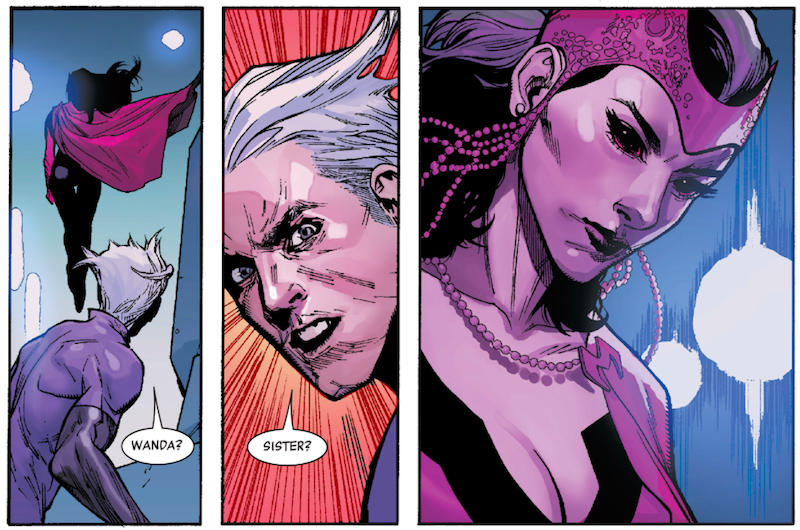 House of M may have been one of Marvel’s more riveting events in recent memory, but it all started because Wanda was taken advantage of by Quicksilver and Magneto during one of her episodes. In that moment, she was less a person and more of just a convenient plot device. James Robinson and Vanessa Del Ray’s Scarlet Witch series was an answer to over 50 years of different writers bending and twisting Wanda into various forms to suit the needs of the stories they wanted to tell. Rather than treating Wanda’s past as a series of problems for others to fix, though, Scarlet Witch focused on Wanda’s person path to mental and spiritual recovery. If in the past, Wanda was defined by her willingness to follow those around her, Scarlet Witch gave us a Wanda sure of her ability to piece herself back together by embracing and trusting herself. Scarlet Witch was primarily a story of Wanda’s personal healing, but the series’ overarching b-plots centered on Wanda traveling across the globe on a journey to heal the very essence of magic. Scarlet Witch gave us a Wanda Maximoff who sought out more information about her Romani ancestry and also tackled her literal (and emotional) demons head-on in a way that the character rarely had before. By the end of the series, Wanda was re-established as one of the most formidable magical forces in Marvel’s many universes and her sense of self and stability is stronger than ever. Which is what makes her appearance in Secret Empire so disappointing. The optics of making a Romani character do the bidding of a fascist overlord who is literally rounding up minorities and killing them are bad on their own. But also, this choice just doesn’t seem well thought out. There are few characters better suited to deal with the rewriting of reality than the Scarlet Witch, but rather than explore that element of who she is, Secret Empire instead just tossed her into hell and called it a day.